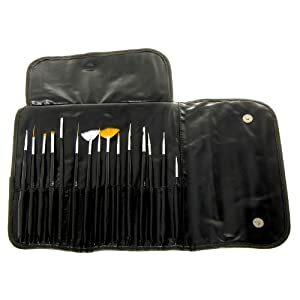 *HOT DEAL* MASH Professional 15 piece Nail Art Brush Kit Set - 50% Off! *HOT DEAL* MASH Professional 15 piece Nail Art Brush Kit Set – 50% Off! Have you seen all the Nail Art pics floating around Pinterest? I don’t know how they do it — but with a little help from this MASH Professional 15 piece Nail Art Brush Kit Set, my daughter and I are sure gonna have fun trying to recreate some of the pictures!! This kit is marked down 50% right now! Grab it for $9.99 while you can!!! The price listed above was as of 2:24 pm CST on June 29th, 2012. Prices and availability subject to change. Make sure you confirm the purchase price prior to purchase.